Here at Greener Horizon, we have a history of landscaping beautiful water features, such as those that include live fish like as koi and goldfish. During the design phase, we get a lot of questions about making sure the fish are protected, especially from the cold New England winters. We’ve compiled a list of some tips for caring for your backyard pets during the heart of winter, especially making sure they survive when your fish ponds start to freeze. As the water gets colder, your cold-blooded fishes’ metabolism will start to slow down. While during the summer it’s suggested to feed the fish with a high-protein fish food to help build up some fat reserves for the winter months, during late fall and winter time (below 60 degrees or so) it’s time to switch to a wheat germ-based food. These kinds of feed are easier for the fish to digest, which is important since that process takes longer in the winter months. Also, make sure the fish are fed less during this time: twice to three times a week should be fine. Once temperatures drop below 39 degrees most fish enter a near-hibernation state: at this point avoid feeding them altogether as their digestive systems shut down. In New England, you’re most likely looking at a frozen pond at least several times between December and March. While your fish themselves will be okay in anything in the shallowest of ponds, there are some steps to avoid a dangerous environment. Depth of Pond: When designing a pond, you’ll want it to be at least 18 inches of depth to have a good margin of cold water beneath the ice. Going up to 30 inches should avoid trouble in the most troubling of Nor’easters. Toxic Gas Buildup: The biggest danger of a frozen pond is trapping toxic gasses (that come naturally from decomposing organics) in the water with the fish. The best solution for this is a pond de-icer: a small buoy with a heating element that leaves a hole for the gasses to escape. Breaking the Ice: While tempting just to go out and break up the ice, keep in mind this can do even more damage to your fish. Not only can the breaking of the ice cause shockwaves that can injure fish, but a rapid change of temperatures can put your fish into shock. Freezing water can result in damage to the pumps and piping. In a worse-case scenario, a partially frozen or damaged pump system can pump water out of the pond but not back in, fully draining in the pond. Water in your pond will form very distinct temperature layers during the winter, especially if your pond starts to ice over. Turn off the pump to avoid mixing these temperatures, which can adversely affect the fish. 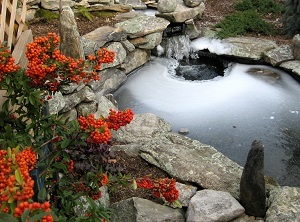 If you’re interested in landscaping a water feature into your backyard or augmenting existing fish ponds on your landscape, contact the landscaping experts at Greener Horizon. We can help you design the perfect landscape for the climate of New England.